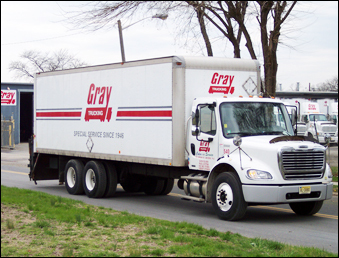 Gray Trucking provides standard Truckload as well as HAZMAT truckload shipments to the lower 48 states. We boast very high safety ratings and on-time service rates. Our trucks have real time satellite tracking in every truck so that we know where your shipment is at all times. Our in house team has centuries of trucking experience between them to help organize and schedule your pickups and deliveries. We can even help you optimize your shipping routes and delivery points to maximize the economy of your shipments. Some of our clients take advantage of our Trailer Pool Service. This allows the customer to have a number of our trailers stationed at their pickup and delivery points that are ready to go at a moments notice. This option is perfect for businesses that move freight between common distribution points on a regular basis. Trailer Pool Service saves both time and money while putting the resources of Gray Trucking literally in you back yard.